I woke up this morning at 4:30am and couldn't fall back to sleep. I tossed and turned for an hour before whipping out my iPhone and started playing Bejeweled Blitz. After five minutes of that I made a really sad attempt at trying to fall back to sleep. I gave it fifteen minutes of my time before coming to the conclusion that I wasn't going to be getting any more shut-eye. So I got up. I made coffee. I had my third cup by 7am. I'm contemplating on making another pot since Brett had drained half to bring to work with him (he had to leave for work über early). It's kinda nice being up so early. So peaceful. And quiet. I think I'm actually going to get a good hour of un-interrupted knitting time in before the Munchkin wakes up and makes his way down the stairs. This early wake up time might become habit. I said might. So what am I working on? Remember how I mentioned in this post how there were a bunch of WIPs that I had yet to blog about? Yeah well, this is one of them. This here is my Audrey in Unst that I had started back in October, took a hiatus on in favour of quicker projects in November, and knitted on for a week before putting it down again for the month of December to knit on Brett's sweater. I'm still not done Brett's sweater but I do need a break from it. So back to Audrey in Unst. This pattern is not at all a boring knit per se (although this pattern does reiterate the fact that I'm SO not a fan of twisted ribbing), there is a lot of stockinette involved. I have no explanation as to why this project is taking me so long to knit, after all, it's a cropped cardigan with 3/4 length sleeves! Seriously, what's the hold up? The pattern is extremely well written, the yarn is absolutely lovely to work with, and I'm using my favourite needles. So weird. It's one of life's mysteries, I guess. Aside from taking forever to knit this up, I really have nothing to say about this project thus far. The pattern is pretty darn straight forward. I've been pleasantly and wonderfully surprised whenever I got stitch counts right and on the right side row, and got the exact number of stitches needed to pick up around the armholes without worry. This rarely ever happens to me! I felt mighty clever each and every time. The only issue that has come up is purely all on me - I decided to not do the full amount of twisted ribbing at the hem, and since the sleeve hems are to match, not on the sleeves either. To compensate I had knit rows/rounds of stockinette to the length given in the pattern's specs. I thought about making the cardigan a little longer since it would make it a little more practical and in my opinion more wearable, but decided against it cause I didn't think I would have enough yarn to do so. Well...let me tell you how so wrong I am. The yarn I'm using is SweetGeorgia Yarns (surprise, surprise!) Merino Silk Fine. I had purchased three skeins directly from Felicia a few years ago with the intent on knitting this pattern (see? That's how long this pattern had sat in my queue!). 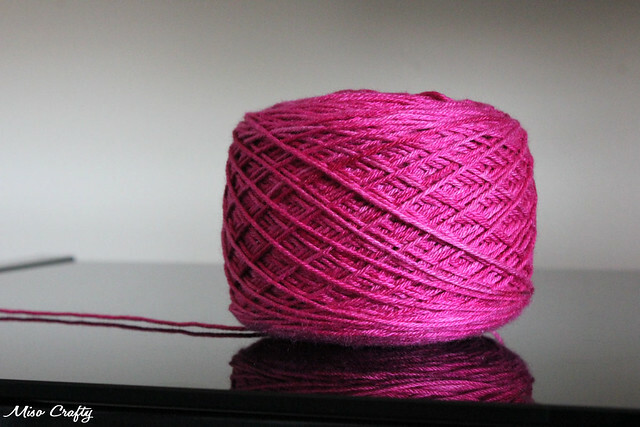 The yarn is pure luxury and has been a pleasure to knit with and the colour...oh my, the colour! Such a gorgeous, perfect shade of pink. My pink! I could have a whole closet full of nothing but this exact shade of pink. Really. I have nothing but pure love for this colour. Anyhoo, this is a hand-dyed yarn and I thought getting a fourth skein so late in the game would be out of the question since it most likely wouldn't match my skeins exactly and knowing my luck the difference would be quite noticeable. So the idea was nixed. And I'm glad too! Cause then I would have that one solo skein stuck in my stash. 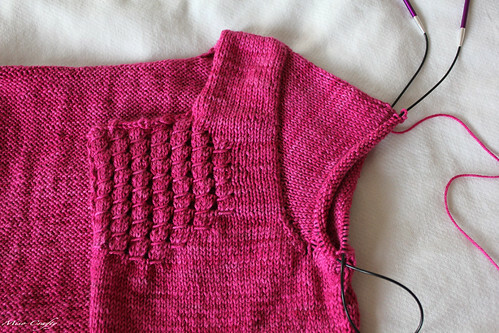 I've already finished the body and one sleeve with plenty of the second skein left. As I type this I am close to finishing the second sleeve without even needing to touch the third skein. After this sleeve all I have left to knit are the button bands and the collar. Yup. I'll have plenty of yarn left over. Which means I could have totally added way more length to this cardigan. Le sigh. Oh well, coulda, shoulda, woulda...right? I guess in the future I'll be knitting some pretty lux hexipuffs for my Beekeepers Quilt! PS: Is it just me or is Blogger really messing up on the formatting front of posts?? Lately my posts have all been publishing with random fonts here and there and I would have to go in and html the crap out of it. Then there's the double spacing action. What's the deal? My Google-fu powers are weak and can't seem to find out what's behind this. I've switched from the old to new back to the old interface, and I've even switched from Firefox to Safari to Chrome to see if that helps. Nope. Le sigh. I just might have to look into other blogging websites if this keeps up.